Here in Korea, university students are able to delay their graduation once even if they finish their courses. By paying a particular extra fee, they can maintain their student status, but they no longer have to attend school. This has become a part of Korean university life, with an increasing number of students who put off graduation. According to the Office of Students Affairs, the number of students who postpone their graduation was 19.67% of all graduates this year. 24.25% of the students delayed their graduation in 2014, 20.23% in 2015. This rate at CNU has been decreasing for the last three years, yet, one fifth of all graduates is a huge amount. The biggest reason for the graduation delay is a tough job market. There seems to be a preconception that graduates have a smaller chance in the job market compared to students who are enrolled in school. The Chonnam Tribune looked into this phenomenon closely, to investigate the validity of students’ putting off their graduation. More and more students consider whether putting off their graduation can actually be beneficial to their career. Lee So-young (Senior, Dept. of Polymer and Fiber System Engineering) said, “Initially, I had never considered putting off my graduation. However, when I was seeking a job, I realized that managing both school classes and preparation for employment is almost impossible.” The problem is that during the preparation period that students spend after graduation is often considered to be a ‘jobless period’. It gives a negative impression of the job market. The companies prefer students who have just graduated. The longer the period they spend for job-seeking after graduation, the more they are considered incompetent. Furthermore, once students graduate, they are often excluded from the benefits or services which the school provides. School job programs are only available for undergraduates. Extracurricular activities including internship programs and various contests of companies are likely to impose some restrictions to the applicants who have already graduated. For example, among 47 big companies in Korea, 33 were exposed only to students. In other words, graduates have few opportunities to join such good experiences. Consequently, they cannot help putting off their graduation. Companies and school governments are driving students to choose delaying graduation. Students preserve their status by paying some amount of money to the school. This has been controversial since students who have put off their graduation do not actually benefit from the school. At CNU, they have to pay 8% of their tuition fee. Many students feel that this is unreasonable; on the other hand, the school has a clear reason that receiving the fee is inevitable due to the complicated circumstances of the school. As the school facilities are limited, it is necessary to get extra fees from them in order to run the facilities properly and safely. Nonetheless, students seem to have different ideas about it. Kim Min-woo (a student who has delayed graduation, Dept. of Polymer and Fiber System Engineering) said, “Schools, which should offer students a wide variety of learning opportunities, are charging a fee to the students who want to learn more. It shows the fact that schools are becoming constantly commercialized.” Like him, most students think it is unreasonable to make students pay extra fees for postponing their graduation. These days, most universities have a tendency to encourage students to graduate on time. The main reason is that the number of students delaying graduation can negatively affect key performance indicators to assess universities such as the number of students per full-time professor or the number of library books per student. 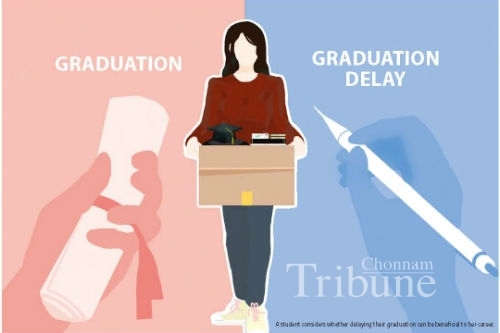 Employers say that the graduation delay is not a good choice for finding a job because in recruiting employees, there are differences between graduates and students. It means that graduation delay is not a solution for employment. However, the purpose of the graduation delay system has to be operated definitely for the students who still need the support and assistance available at school. It is obvious that the system was introduced for students who needed their student status to prepare to find a job. But its original purpose seems to have faded away. Schools do not seem to care for the students who are in need. Students who have put off their graduation are not responsible for the lower evaluation in the university assessment. Schools should try to find reasons why students choose putting off graduation, and seek alternative solutions to encourage them to leave the school on time. Students who delay their graduation is not the only problem, it is closely related with the employment crisis itself. Therefore, the social trend in the job market must be changed in order to improve the situation. It can be solved only through the full cooperation between students, school, and society. As long as the unemployment rate of university graduates is high, students will probably continue to choose delaying their graduation for their career as a realistic alternative.